BP has now sent a reply to Admiral Watson in regard to the Coast Guard request that BP provide a “better” plan for dealing with the oil spill at the Deepwater Horizon site. In part the response deals with increasing the capacity for the collection of oil through the provision of additional vessels, in part preparing better for a Hurricane, and in part providing better back-up systems. 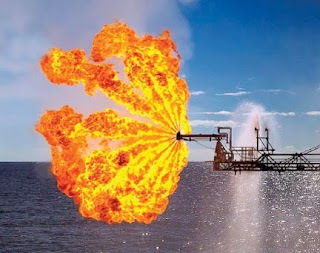 This post will go through and explain what the letter describes, and I intend, in a later post, to explain in more detail why BP should plan for a steadily increasing volume of oil. 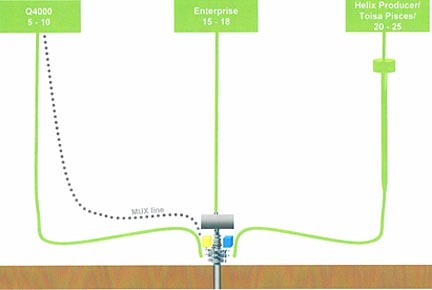 Simplistically it is because the erosion from the sand in the oil continues to widen passages through the reservoir, the casing and lining of the well, and the BOP. The new "production" volumes have also been released. For the last 12 hours on June 14th (noon to midnight), approximately 7,800 barrels of oil were collected and 16.8 million cubic feet of natural gas were flared. • On June 14th, a total of approximately 15,420 barrels of oil were collected and 33.2 million cubic feet of natural gas were flared. The first step in the new process begins almost immediately, and that is the redirection of oil, so that it flows up through the choke line of the BOP to the Q4000. This is a reversal of the flow of mud that was used in the Top Kill option tried earlier. The system is being tested today, and if it all works, then by tomorrow (Tuesday the 15th) the oil and gas drawn off from the well, will flow up the 3-inch lines to the Q4000 where the oil will be vaporized and burned with the “Evergreen Burner.” Given that this will burn oil in the range from 5 – 13,000 barrels a day (at $75 a barrel) that is a lot of money (up to $1 million a day) going up in smoke that could have gone to relief – but that is becoming small change. However a single Burner can only burn 3,000 bd, so it would appear that a multiple mount is being built. There are some concerns with this plan. Some of the “junk” pumped into the well might be flushed back out by the oil, into these smaller lines, and block them. The sand in the oil that is eroding the BOP and casing could also erode the choke and kill lines, which are vulnerable, particularly at the couplings and with the hose jumpers. Those concerns will continue until the more permanent risers are installed . That should bring the capacity of the system up to 28,000 bd. But the continued erosion of the flow paths means that additional provisions should be on hand. At the end of the month the more permanent riser (for which they just located the suction pile) will be in place. This will allow a more permanent sub-sea system to be installed that will be less vulnerable to Hurricanes. 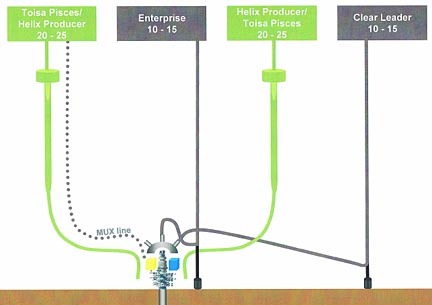 The riser will provide oil to either the Toisa Pisces, or the Helix Producer. This latter is a Floating Production Unit that is already in the Gulf, but working on the Phoenix field. As a result of the HPI's involvement in the BP spill response, production from Helix ESG's Phoenix deepwater oil field will be deferred until the HPI comes off hire with BP. Helix ESG expects the financial contribution from the BP HPI contract will offset the financial impact from deferred production of the Phoenix oilfield. The Phoenix oil field, located in the Gulf of Mexico's Green Canyon block 237, is ready to commence production upon HPI's return to the site, with all necessary U.S. Coast Guard and Minerals Management Service permits and approvals in place. However, the opportunity costs for this additional back-up are only going to become obvious in the longer term. Step 2 – the second vessel arrives and is connected. At this point in the process, with a capacity of 53,000 bbl a day there is still the concern that the well could be producing up to 100,000 bd, and so additional capacity is still required. This will come by now supplying an FPSO to the site. I had mentioned this last week at which time BP did not seem to think one was necessary. They have now changed their minds and a vessel (yet unidentified) will be released from South America to come to the Gulf. It will take 4-weeks to arrive, and is being brought, in part, to provide insurance in case the Toisa Pisces, or the Helix Producer should have a problem. This can handle some 25,000 bd. And will raise to overall capacity at the site to 80,000 bd. However the flow paths will be changed, so that the primary vessels receiving oil are the Helix Producer and the Toisa Pisces, which can handle up to 50,000 bd, and the other vessels available (the Enterprise and the Clear Leader, which is a second drillship, – the Q4000 being possibly released) providing additional coverage. Step 3. The additional flow and storage capacities by mid-July. 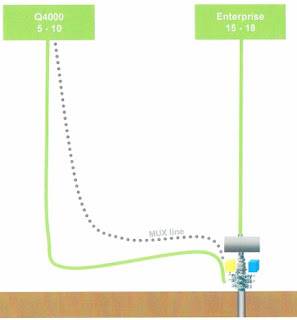 As part of the transition the controls of the feed lines on the BOP, which currently pass through the yellow pod on it, must be transferred to one of the FPSO’s and to back this up, the engineers are now working to resurrect the blue pod on the BOP and make this available. BP add some caveats to their current plans. 1. Changing the cap could cause problems. 2. It depends how good a seal the new cap gets as to how much oil will be collected. 3. The flow rate is not known, and so the plans are only contingent on the estimates. 4. Leaks will occur whenever the system has to change. 5. They can’t collect oil in the middle of a hurricane. Now all we have to do is to see if President Obama leaves them with enough cash to pay for all this. HO -- If I recall correctly, the peak rate from any well in the Gulf is not much in excess of 40,000 BOPD -- and that is a well engineered for maximum flow. While sand in the well stream could cause erosion of whatever constrictions there are in the BOP, the reservoir pressure is coming down too. Remember those extensive Oil Drum discussions about the rapidity with which GoM wells decline. Transport of fines will likely increasing formation damage in the reservoir close to the well, which would lower the production rate. And issues like paraffin, asphaltene, and wax deposition in the flow path (common in GoM) could further cut the flow rate. Bottom line -- BP is wise to plan for increasing rate, but Mother Nature may be working to reduce the rate. Now if the Obama Administration would stop posturing, suspend the Jones Act, and start bringing in foreign "super scoopers" to really get after skimming the oil spill, we might start to see progress. Unfortunately, the Administration has so far demonstrated even less competence than BP. At least BP is trying! The problem I believe is one of perception, and by putting all these precautions in place BP can be viewed as moving ahead of the curve instead of being behind it. I suspect that they think that the new cap will retain virtually everything and that they will, at last, be able to come up with a definitive number that is smaller than the largest capacity they are promising to capture. But at this stage, who knows?